An initiative of Global Voices, we foster collaborative media analysis around representations of the world and each other. The Reframed Stories Project asks people to respond to dominant themes and issues that appear in news coverage about their communities. These stories are reflections by people who are frequently represented by others in the media. Word clouds are created using the Media Cloud platform, a data analysis tool which examines a collection of media outlets over a specific period of time, allowing participants to analyze and discuss preliminary insights into how they might be represented in the media. The project refrains from making conclusive pronouncements about the data, and instead is a starting point that creates space for discussion about how they can help shape their own media representation through digital media. Elena Gualapuro is a member of the Association of Audiovisual Producers – Kichwa Otavalo (APAK). 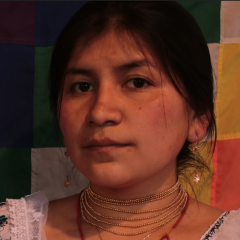 The following is a transcript of the video about Elena's analysis of the word cloud for the terms, “indígena” (indigenous) and “mujer” (woman) within the Ecuadorian context. What about the word cloud drew your attention most? La palabra que me tocó analizar es sobre la mujer indígena, en donde resaltaban más la comunidad, el gobierno, pero había palabras tan alejadas (de nuestra realidad) que veo que la gente no está hablando tanto sobre el reconocimiento que nosotros hemos buscado. Incluso salía la palabra “presidente”, pero no sale algún nombre de alguna lideresa mujer. The word that I analyzed was about indigenous women, where community and government were highlighted, but there were words so distant (from our reality) that I see that people are not talking about much about the recognition we have been seeking. Even the word “president” was there, but there was not the name of a single female leader. According to the word cloud, how have indigenous women been represented in the media? La manera de cómo me representa el medio tradicional me parece que no me representan. En mi opinión, porque en sí los medios tradicionales lo que te presentan es, por ejemplo, una señorita que va a ponerse tal vez a explicarlo del clima, es una señorita que tiene supuestamente un modelo perfecto de mujer occidental, cosa que no me siente identificada con eso porque es como un estereotipo que la sociedad y el sistema nos ha enseñado, que la belleza es superficial, y lo que está aquí (en nuestra mente), nuestro conocimiento, ¿eso a dónde va? Entonces me parece que los medios tradicionales no me representan para nada. Traditional media does not represent me. Traditional media presents a young lady presenting the weather or a young lady who is supposedly the perfect example of a Western woman, of which I don't feel identified. They are societal stereotypes and the system has taught us that beauty is superficial. And what about what's here (in our mind), our knowledge. Where is that? So I don't feel that the traditional media represents me at all. How should indigenous women be represented in the media? Como mujer indígena, las palabras que me gustaría que resalten sería lideresa, nombres de lideresas mujeres que ha habido desde nuestras bases porque sí las hay. También me gustaría que (se demuestre) la fortaleza de una mujer, el cómo lleva adelante a un grupo, el cómo se preocupa por todo porque en si una mujer, cuando hay algún tipo de movilización, no es porque sea mujer, pero si hay que llevar algún tipo de alimentación o algo, ella también se encarga de eso para que todo vaya bien, están pendientes de que todo esté bien. As an indigenous woman, I would like to see women leaders highlighted (in the word cloud), the names of women leaders from our bases because I know they exist. I would also like the media to show women's strength, how they lead a group, how they take charge of everything when there is some kind of protest, not because they are women, but if food is needed, they also take care of that so that everything goes well. They make sure that everything works. What words should a word cloud for ‘indigenous women’ have? Con respecto a los medios comunitarios, yo me siento identificada, ellos sí me representan porque ellos no te están mostrando ahí en una cámara un modelo perfecto de mujer, al contrario, ellos demuestran la realidad de cómo es una mujer, no sólo físicamente, sino cómo es una lideresa, cómo es una guerrera, cómo lleva adelante a un grupo, cómo es una líder y está firme en sus ideales. With regard to community media, I feel identified, they do represent me because they are not showing a perfect example of a woman. On the contrary, they demonstrate the reality of what a woman is, not only physically, but how she is a leader, how she is a warrior, how she leads a group, how she is a leader and firm in her ideals. This is part of a Rising Frames series developed in close collaboration with the organization El Churo based in Quito, Ecuador. They organized a workshop held on April 21, 2018 that brought together representatives from various collectives and groups to examine how they or issues they care about are represented in a collection of Ecuadorian media and to create stories in response. Belén Febres-Cordero assisted with the transcription and translation of the post, which was edited for clarity and length. Learn more about how frames work in this two-part series and through our Framespotters series.